Trail guide by Lisa Nicholl – thanks Lisa! The original names for two of the tracks on Mt Thomas were Track One and Track Two. These original names stayed for many years. But in recent times DOC have changed them to Summit Track and Ridge Track. Why change a perfectly good name? EXACT LOCATION: DOC car park at the end of Hayland Road. From Rangiora head north crossing the Ashley River bridge. Follow this road till the sign for Okuku. Turn left onto Hodgsons Road, pass the South Loburn School and follow until you get to Hayland Road. Turn right, Mt Thomas is signed as 3km further up the road. DEFINING CHARACTERISTICS: Mostly single track, last 2km forestry road. 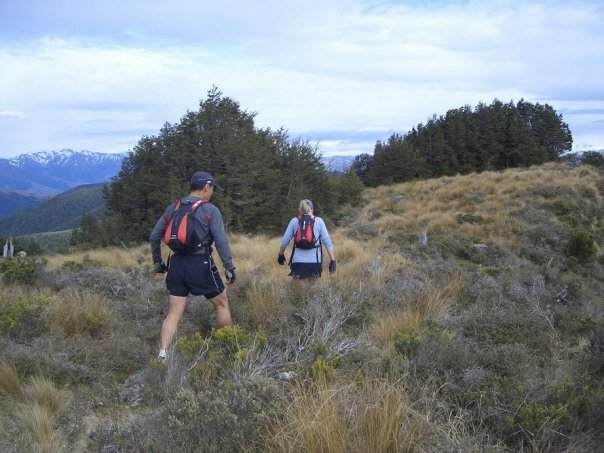 RUN IT: Start at the DOC carpark, cross the small grassy area and turn a sharp right (Do not head into the trail marked Wooded Gully). Follow this trail through some nice greasy mud to a stile. Cross this and follow the trail. It will turn left and up. Within the next 300m there are two shingle roads to cross, keep following the single trail up and up and up. After approx 3km the trail hits an old forestry road, turn left continuing up to the summit and the trig. From the DOC carpark to the summit it is 3.5km with a total climb of 700m. From here follow the single trail to the left along the ridge. This will eventually connects with another trail at the top of a saddle. Continue straight ahead, do not turn left down the Wooded Gully track. Continue along the trail, out onto the west summit of Mt Thomas. At the DOC sign post, follow the directions to the left for the Ridge track back to the Picnic area. Eventually you will come out of the beech forest and into open forested land. Follow the DOC poles back to the carpark. The forestry road will veer right and left a couple of times depending which road you take. POST RUN GOODNESS: There are no cafes or eateries between the trail and Rangiora. Just good pure countryside. The locals’ choice for 2011 is to pop home, clean up and then flop on the couch with a good plate of nachos. Summit climb was brutal! 1:24 for the loop, not sure id call myself an Elite though…..